The extent of the problems in the European Banking System is TARGET2 and its balances of the National Central Banks of the Eurosystem. These balances, or rather imbalances, reflect the direction of the capital flight. And there is only one way: from Southern Europe into Germany. After Mario Draghi’s famous words “I do whatever it takes to save the euro”, things seemed to improve; however, since January 2015 problems have been escalating again. The excess money flow from banks in one country to banks in another country has to be compensated for. It can be done with loans or so called interbank lending. If there is no compensation from the interbank market (because banks do not trust each other any more) then country A has a liability and country B has a claim and compensation comes from the ECB. 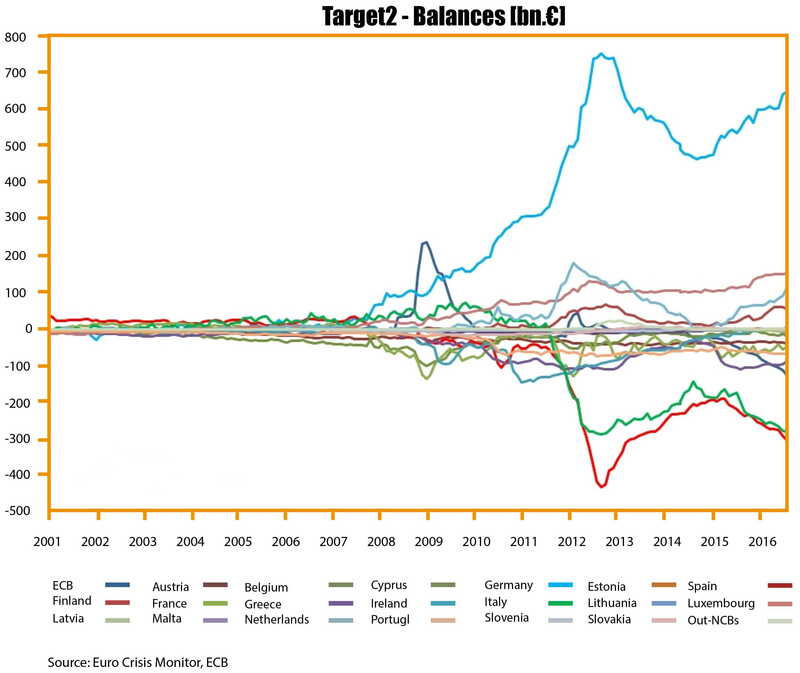 Therefore TARGET2 balances are net claims and liabilities of the euro area NCBs vis-a-vis the European Central Bank (ECB). As long as the interbank money market in Europe functioned correctly, balances were relatively stable. Excess money that flows from Greece to Germany was compensated for with the purchase of Greek bonds or by interbank lending. 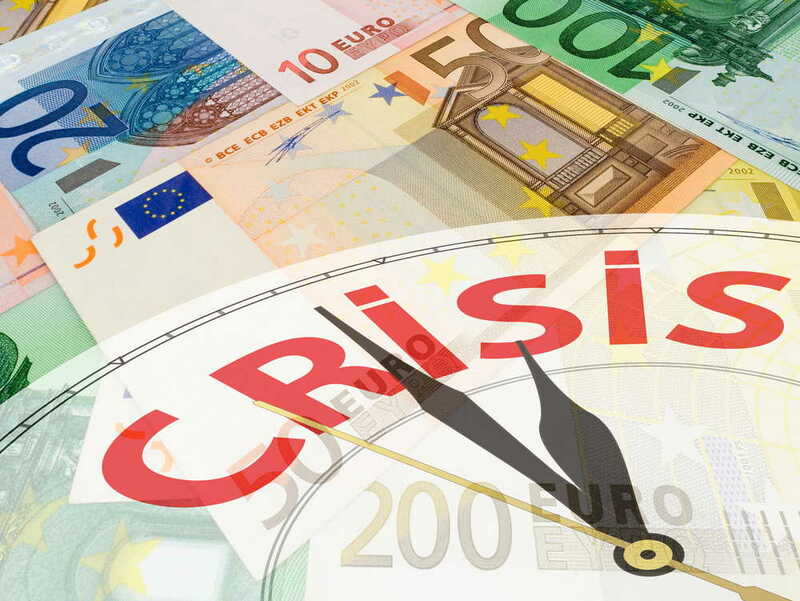 However, after the crisis in the Euro Area, banks have stopped lending each other money and the compensation has to be provided by the central bank. As the Euro Crisis Monitor shows, on the basis of the ECB data, the money is going now to Germany and also to Luxembourg, the Netherlands and Finland, while all other national banks have increasing liabilities! The worst situation is in Spain and Italy, which are now close to the 2012 negative records. The current imbalance, or the excessive flow of money from Southern Europe to Northern Europe is not related to the trade balance deficit. Spain and Italy have managed to reduce their trade balance deficits. We hope clients from Banca Monte dei Paschi di Siena have not moved their money to Deutsche Bank. The Greek balance seems to be improving, but it is due to capital control: banks in Greece are limited in using the system. Even the ECB analysts do not hide the truth. As the monthly bulletin from May 2013 specifies, “the TARGET balances are a manifestation of underlying tensions in the Economic and Monetary Union (EMU), highlighting the need for macroeconomic imbalances to be addressed, trust in banking systems to be re-established, and the institutional foundations of EMU to be strengthened.”1)Target Balances and Monetary Policy Operations, Source: ECB Monthly Bulletin May 2013 The whole system still can exist only because of the massive intervention of the ECB. OK, this shows European transfers only, so why do all the Outward transfers, show up an Incoming transfers? 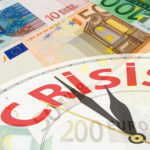 eg Spain’s Banks transfer 1billion euros out, MUST show up as someones 1billion inflow? Yes/No? The areas under (or above for Outflows) the curves should total the same, this is a closed system, the sum total should be Zero should it not? Yes, this is only in Europe. It is the system that transfers money from National Banks. Otherwise, Italy can create Euro’s (debt) and buy whatever they like in Germany. But even if we allow this money flow happen, it should not be in the Target2.Italy should lend the money from a German Bank. This money will then be flown back to Italy through the Target2 system. Yes, 1 billion outflow has to be countered by one billion inflow. Yes, the sum has to be zero, and there should not be any liabilities. Up to 2008, this seems the case. Target2 is a clearing system. It is not a banking system. If the Euro breaks up the German NCB has to receive money from Italian and Spanish NCB’s. This is, of course, theoretical. A euro break-up will blow up a big part of the Western financial system; the Euro will have hardly any values in such an eventually.